Chronicled in countless newspapers across the country including ESPN, we were all inspired by the recent act of kindness of high school junior Meghan Vogel. At the recent Division III girls state track meet at Jesse Owens Stadium in Columbus, Ohio, a high school junior by the name of Meghan Vogel captured the hearts thousands around the country. In the finals Meghan had won the girls 1,600 meters race. In a personal best, she posted a time of 4:58:31, the first time she had broken the five minute mark. After an awards ceremony Meghan had time to take a short break to rest and get ready for the 3,200 in which she was seeded seventh. 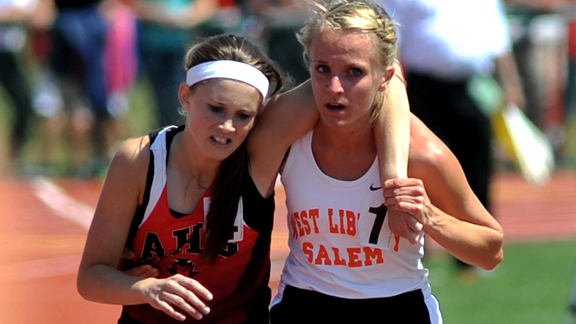 Posted on June 10, 2012, in Inspiration, Leadership, Motivation, Success and tagged Doug Dickerson, Sportsmanship, Story, Track Meet. Bookmark the permalink. 3 Comments. Pingback: 5:08 am and Inspired… – Lead.Learn.Live.